Green Giant Coupon is a mailed coupon available at Save.ca. This is a hidden coupon only available through a special link, you can find it here. You can find the Green giant coupon here on their hidden portal. Select the coupon, create an account and you can request Save.ca to mail out the coupon to your mailing address. It will take about 2-3 weeks for it to arrive. 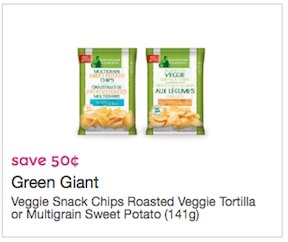 This is a Green Giant coupon to save $0.50 on veggie snack chips roasted veggie tortilla or multigrain sweet potato (141g). Green Giant coupon is valid only in Canada. You can find Green Giant veggie chips in any supermarket or grocery store. This is a limited time offer coupon, claim your coupon now. 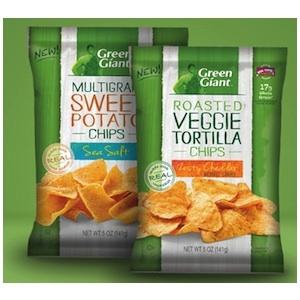 Taste the Green Giant flavors of delicious sweet potatoes and smoky barbecue in your new favorite veggie snack chips.